Saxophonist Brian McCarthy is a staple of the Burlington jazz scene. He’s been heard lending his considerable chops to myriad local ensembles, including the Ray Vega Quintet and the Grippo Funk Band, as well as holding down the horn section on Phish bassist Mike Gordon’s last solo record, Moss. McCarthy, who teaches at the University of Vermont and Johnson State College, is a highly regarded player, composer and arranger — he’s penned works for jazz titans Kenny Garrett and Mulgrew Miller, among others. But until recently, he’s long been relegated to the smoky shadows of our collective local jazz cabaret. On his quartet’s self-titled, debut full-length, McCarthy snags the spotlight for himself, delivering a sparkling album of original compositions — and one cover — that deserves a prominent place in the record stacks of local jazz aficionados. “Flood Gates” is aptly named, as pianist Tom Cleary opens the record with a torrent of churning chords, accented by drummer Jeff Salisbury’s blooming cymbal splashes. As if caught in the current, McCarthy’s sax winds aimlessly before breaking free from the eddy and skimming atop the band’s swiftly moving surface with graceful, fluttering tones. But Cleary will not be denied. Midway through, the keyboardist takes command and unleashes a raging swell that threatens to swallow the entire composition. Eventually, the waters recede as McCarthy leads the quartet to a peaceful resolution — though not without one last breaking splash from Cleary, who punctuates the tune with a sneaky staccato hit at the finish. “Unexpected” is a sinewy ballad, framed by Cleary’s smooth, syncopated keystrokes. McCarthy’s cool tenor yawns with steamy, late-night ease, swelling in concert with Cleary. Meanwhile, John Rivers delivers a sly acoustic bass groove that fills the fleeting pauses in Cleary and McCarthy’s bleary-eyed conversation before riffing on his own for a bit at the close. The album’s lone cover is a reworking of Don Raye’s “You Don’t Know What Love Is.” McCarthy’s arrangement is sensitive to the source material but not enslaved to it. Both he and Cleary take playful liberties with the familiar melody in various turns but never completely abandon the song’s lovelorn feel. “Pondering” is a bouncy meditation. The tune breezes along pleasantly enough, but it lacks punch. Despite a mildly compelling flurry near the finish, it feels safe and unrequited. “Undecided” is more adventurous and truly showcases McCarthy’s talents. As a player, his tone is alternately pure and rough hewn, altering the mood at will. As a composer, McCarthy’s sparse, open arrangement leaves room for his talented bandmates to stretch out, while offering just enough of a framework to build upon. It is another highlight in an album full of them. 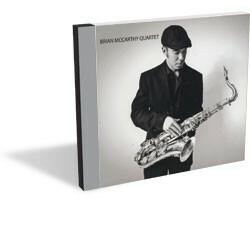 The Brian McCarthy Quartet celebrate their album release this Friday, April 22, at the Marriott Harbor Lounge in Burlington.